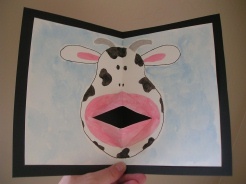 The Talking Cow Card has a pop out mouth and is a great all-occasion card for kids to make; or it's just as fun to create it for yourself and make your cow talk by opening and closing the card. This craft is rated as difficult because it can be a little tricky to cut the 'pop out' mouth, even for an adult (once you've done it once, it's easy). Any child of any age can draw a cow around the mouth if it has been cut for them ahead of time. 1. Fold your white paper in half and cut a straight slit. Make the cut half as big as you would like your cow's mouth. Cut the slit about 2/3 down the page. 2. Fold the edges down to make 2 triangles, then open your paper all the way. 3.Hold the paper with the folded edge towards you, as shown in the picture. 5. The inside of your card should have a pop out mouth now (see picture). 6. Now your ready to paint or draw on your cow. Once you've finished your drawing you will need to glue or stick on your card back (which is also the color inside your cow's mouth). Now make your cow talk! Keep it, or give it to a friend!